The President’s House is located between Coburn and Carnegie halls. 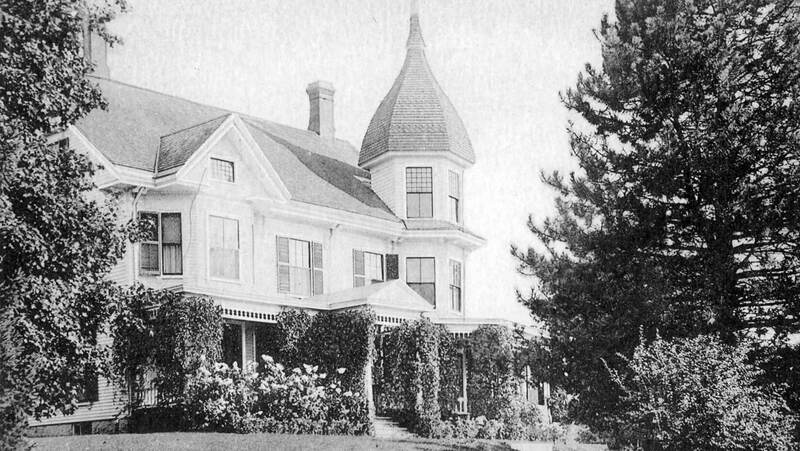 Built in 1873, it first became the home of Maine State College’s second president and first faculty member, Merritt C. Fernald, and his family. It was originally built in the Federal style, with Italianate ornamentation possibly added later. In 1893, the house was devastated by fire and it required an extensive renovation. When it was remodeled, the addition of a new wrap-around porch, a two-story projecting dormer at the north end of the façade, and a three-story corner tower at the southwest corner of the house transformed it into a stylish Queen Anne residence, although a close look still reveals the original Federal-style building underneath. In 1931, the reception area of the main floor was greatly expanded with the addition of a new room at the north side of the first floor. The carriage house was converted to living quarters and the south portion of the wraparound porch was enclosed in the late 1920s or early 1930s.